The squat is a popular dry-land exercise for swimming. This is likely due to the numerous muscles involved and the common belief this motion mimics a flip turn (despite contradictory research). However, the effect the depth and load on the squat are unknown. Muscle force is hard to measure, therefore motion analysis techniques combined with the equations to solve for the net joint moment (NJM) acting on a segment are used to determine the mechanical effort required. 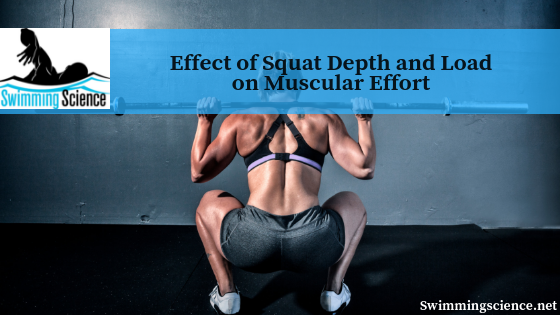 The purpose of this study was to investigate the effects of barbell load and squat depth on hip extensor, knee extensor, and plantar-flexor relative maximal effort (RME) during squatting exercise. Prior to the third session, maximum voluntary isometric contractions were performed to determine the maximum strength of the participant’s hip extensors, knee extensors, and ankle plantar-flexors. A significant interaction between barbell load and squat depth on hip extensor, knee extensor, and ankle plantar-flexor RME was found. For ankle plantar-flexor RME, load had a greater effect than depth. Barbell load had the largest effect on the knee extensors. Hip extensor noted the largest alteration with squat depth, but squat load noted similar increases. The key findings were that barbell load had a more prominent effect on the ankle plantar- flexors, whereas the barbell depth had a larger influence on the knee extensors. The hip extensors had a similar increase with load and depth. Squatting depth and load alter the involvement of the hip and knee extensors and ankle plantar-flexors. Therefore, these differences must be considered when determining load and depth for each swimmer. For example, a swimmer with knee pain likely needs improvement in hip extensor, not knee extensor strength, and a heavyweight with low depth are indicated. Should Swimmers Squat with a Heel Lift?